Could be the same ones that thought Art of Aurora was going to do well too because Art of Ariel did so well. People are valuing it high because those who can't get DSF or WDI pins directly need something low LE to try to trade for those harder to get pins. These are not Reveal/Conceal Girls which were surprise rare in park releases that got suddenly very popular and weren't replenished much and whose edition sizes were never confirmed making their mystery and scarcity part of their appeal. The comparison to Art of line is more apt with the more popular characters bound to do well (though not likely Art of Ariel well). Also, I could be wrong, but I think Ariel is the only low LE pin from the Art Of series, which helps explain the vast disparity in values. Aurora is LE 500 and I think the others are like 1000 or higher. The fact that these Silhouettes will likely all be LE 300 definitely gives them an edge, but again, it all remains to be seen. That's my Disney pins over-analysis of the day, lol. Too much time on my hands tonight. If given the opportunity to buy a Rapunzel pin at cost, always buy a Rapunzel pin at cost. I think the Dalai Lama said that. Maybe the Pope. Papaya, raikipins, watzshakinbacon and 3 others like this. I think it's carved into the Lincoln Memorial. UPS says I'll get mine today. Very curious to see what it looks like in person. Personally I predict the prices going down. This first one caught people off guard, and the scramble to get one is driving up the cost. It's a lot bigger than what I was thinking. Around WDI size. Papaya, raikipins, Purplemandms and 3 others like this. I think the hype is because the Belle is gorgeous, and being a silhouette she avoids the problem of wonky eyes that befall so many otherwise amazing pins. The jumbo size is very attractive too! Of course the biggest draw for me is that I *hopefully* will be able to get some of these at cost because they are on the site. Not living near the parks makes it pretty much impossible for me to get any pins that aren't just for my collection. I honestly feel like the hype is deserved from what we have seen so far. Some re-sellers might be comparing it to other series, but I think a lot of folks just saw the potential and jumped on it. Ultimately it does get frustrating how so many LE Disney items pop up in price immediately, but what can I say? Disney do a good job with their media, marketing, and the quality of their products. I'm a fan so I can't judge others for bidding up high for a lovely piece of memorabilia. very nice! it's really pretty! Just received mine today and while it is a very pretty pin, Disney is doing nothing to protect them during shipment. Mine were just thrown into a big box with a few other things I'd ordered. There's no protective covering at all, so they got a little dinged up during shipment. Not happy about something that could have been so easily prevented, especially when they were pretty expensive to start with! Yes, that was my point. 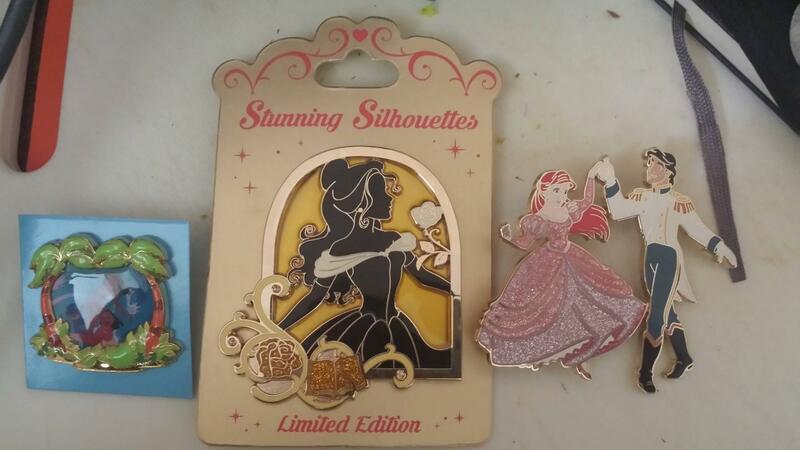 People bought these online who couldn't buy DSF or WDI pins directly and will then use these to try to trade for comparable low edition hard pins. Used to be that everyone had a shot at DA and DS pins and would use those to trade for in-store or in-park pins. 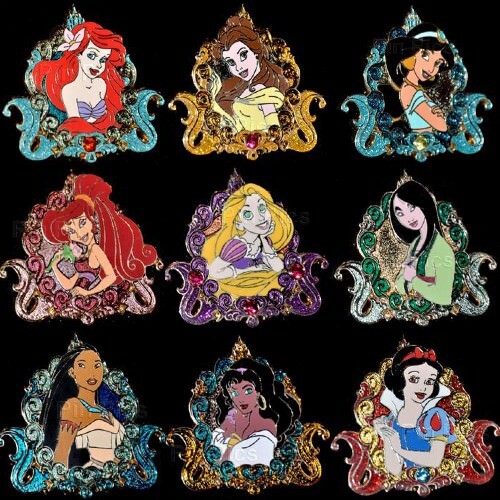 For the past few years there has been little released online of any value that would be comparable traders for current popular low edition pins, so of course people would buy these when they turn up at retail to try to use them as good traders. Just got mine today. They were just in a plastic envelope, no protection at all! However, they are bigger and more beautiful than I thought they would be! Oh of course I understand why people rushed to buy this at retail lol, I was talking about the secondary market and the mentality of people paying those prices, as seen in my prior comments. I certainly do hope there are more online releases such as this for those who don't have the privilege of accessing the parks/stores. I would love to see a more level playing field, so to speak. The monthly subscription Park Packs are a great concept, too, although the fact that they're only LE 500 and everyone gets the same pins does make them a little less competitive in regards to trading. I hope they'll eventually offer a version with various lower LE's assigned to subscribers at random. I NEED this pin for my Beauty & the Beast collection! I decided to change the title so we can use this same thread for when the second in the series shows up! LittleBird and Disneychildwithin like this. That really is a BEAUTIFUL pin. Good thing I don't have any room left on my BatB board.